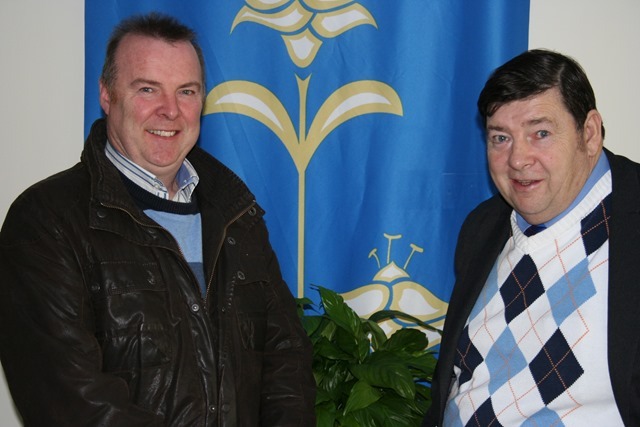 Pictured in the foyer of Our Lady of The Wayside Church after the meeting Peter Murphy, Mentor, and on his left Leonard Hatrick, President of IMPERO. Click to enlarge. A winter interim meeting of IMPERO took place in Our Lady of The Wayside Church, Jenkinstown, on 15 November 2014 starting at 14:00. Present: Francis McCormack; Paul Smyth; Leonard Hatrick, President; Archbishop Michael Desmond Hynes OMD PhD, Vice-chairperson; Kevin McGeough, Treasurer; Edward S. Crudden; Seán Crudden, Secretary; Peter Murphy, Mentor. The archbishop took the chair in the absence of Anne Muldowney, chairperson. The minutes of the Spring interim meeting were read aloud by the secretary and adopted on the proposal of the Archbishop seconded by Edward S. Crudden. The secretary also read out an account of the General Assembly of IMPERO which took place in June. For information of those present. The archbishop reported that the North Louth Joint Policing Committee with the recent local elections has almost reached the end of its term. There will be a new structure replacing the Co. Louth Community and Voluntary Forum. It remains to be seen what this will be and how the new structure will involve contact with policing. The secretary reported that the creative writing classes earlier in the year had concluded successfully. Thanks are due to tutor, Linda Newe, and also to Sinéad Fearon, community education officer with Louth/Meath Education and Training Board. The secretary suggested that we might organise in the New Year the reading of a play among ourselves. He reported that he had met in September Colette Nolan, CEO of Irish Advocacy Network, and her PA, Gráinne Ferris, at a graduation ceremony in DCU for Peer Advocates, at their invitation. It seems that IAN will be sending a delegate to the ENUSP 7th General Assembly which will be held in Hillerӧd from 11 to 14 December 2014. The question arose was tax payers money being spent wisely in the case of bodies like IAN and MHC or is all this merely cynical window dressing? IMPERO has renewed its membership with ENUSP and update details for their site. Seán Crudden was ratified as IMPERO delegate to Hillerӧd. There was a lively and dramatic discussion on suicide prevention, crisis intervention, police. Francis suggested the use of a refuge or “half-way” house as an alternative or precursor to mental hospital. Clearly if a young person in crisis gets hooked into psychiatric drugs they are looking at a life-long dependency on these drugs with all the attendant disadvantages such as difficulty holding a job or damaged marriage prospects. So is it wise to plunge a young person directly into the psychiatric system? The mentor drew attention to the role of drug companies and suggested more alternatives and a more holistic approach to mental illness. It was accepted that IMPERO should be diplomatic and refrain from accusing or condemning other organisations in the field. A mechanism for complaints was mentioned and the mentor suggested that for the moment IMPERO should ventilate its general concerns through its delegate to Hillerӧd. The next interim meeting will take place in Spring, Saturday 21 February 2015, starting at 14:00, in Our Lady of The Wayside Church, Jenkinstown. You are currently browsing the impero blog archives for November, 2014.